One of the fundamental characteristics of brain is its hierarchical and temporal organization: scales in both space and time must be considered to fully grasp the system’s underlying mechanisms and their impact on brain function. Complex interactions taking place at the molecular level regulate neuronal activity that further modifies the function of millions of neurons connected by trillions of synapses, ultimately giving rise to complex function and behavior at the system level. Likewise, the spatial complexity is accompanied by a . complex temporal integration of events taking place at the microsecond scale leading to slower changes occurring at the second, minute and hour scales. These integrations across hierarchies of the nervous system are sufficiently complex to have impeded the development of routine multi-level modeling methodologies. One of the fundamental characteristics of the brain is its hierarchical and temporal organization: scales in both space and time must be considered to fully grasp the system’s underlying mechanisms and their impact on brain function. Complex interactions taking place at the molecular level regulate neuronal activity that further modifies the function of millions of neurons connected by trillions of synapses, ultimately giving rise to complex function and behavior at the system level. Likewise, the spatial complexity is accompanied by a complex temporal integration of events taking place at the microsecond scale leading to slower changes occurring at the second, minute and hour scales. These integrations across hierarchies of the nervous system are sufficiently complex to have impeded the development of routine multi-level modeling methodologies. The EONS simulation platform provides a detailed representation of chemical synapses, which includes a wide collection of intricate signaling pathways involving complex and nonlinear dynamics. Keeping the details of such mechanisms in larger scale modeling can become computationally costly, yet it is important for the synapse models to remain as accurate as possible to observe the small scale effects, such as drug application, in large scale simulations. Therefore in our lab we propose the use of Non-parametric modeling, using modeling techniques in which the dynamics of a system, such as the synapse, is maintained as much as possible while reducing the computational cost that would be required to implement all the complex details. As a result, we have developed the Input-Output EONS Model, and we have shown that it is capable of efficiently replicating complex nonlinear dynamics that were represented in an original mechanistic synapse model. Thus, we provide a method to replicate complex and diverse synaptic transmission within neuron network simulations. The multiscale modeling project is directly tied to the large scale modeling effort (Project #3) and the Multi-Level Modeling Project in collaboration with University of Utah Salt Lake City . Hu E., Bouteiller J-M.C., Song D., Berger T.W. Simulated postsynaptic calcium dynamics using an integrated model of spine properties, membrane channels, and pumps: validation, and an extension towards multi-scale calcium modeling. Submitted to Frontiers in Synaptic Neuroscience. Computational Neurology – Computational Psychiatry: How and Why; Editors: Peter Erdi, Basabdatta Sen Bhattacharva, Amy Cochran. January 2017, Springer. ISBN 978-3-319-49959-8. Renaud Greget, Selma Dadak, Laure Barbier, Fabien Lauga, Sandra Linossier-Pierre, Fabien Pernot, Arnaud Legendre, Nicolas Ambert, Jean-Marie Bouteiller, Frédéric Dorandeu, Serge Bischoff, Michel Baudry, Laurent Fagni, Saliha Moussaoui; Modeling and simulation of organophosphate-induced neurotoxicity: Prediction and validation by experimental studies, NeuroToxicology 54 · April 2016; DOI: 10.1016/j.neuro.2016.04.013. Keller, Florence; Ambert, Nicolas; Legendre, Arnaud; Bedez, Mathieu; Bouteiller, Jean-Marie; Bischoff, Serge; Baudry, Michel; Moussaoui, Saliha; Impact of synaptic localization and subunit composition of ionotropic glutamate receptors on synaptic function: modeling and simulation studies, IEEE/ACM Transactions on Computational Biology and Bioinformatics · May 2016. DOI: 10.1109/TCBB.2016.2561932. Sushmita L Allam, Jean-Marie C Bouteiller, Eric Y Hu, Nicolas Ambert, Renaud Greget, Serge Bischoff, Michel Baudry, Theodore W Berger, Synaptic Efficacy as a Function of Ionotropic Receptor Distribution: A Computational Study, PLOS ONE 10(10):E0140333 · October 2015. DOI: 10.1371/journal.pone.0140333. 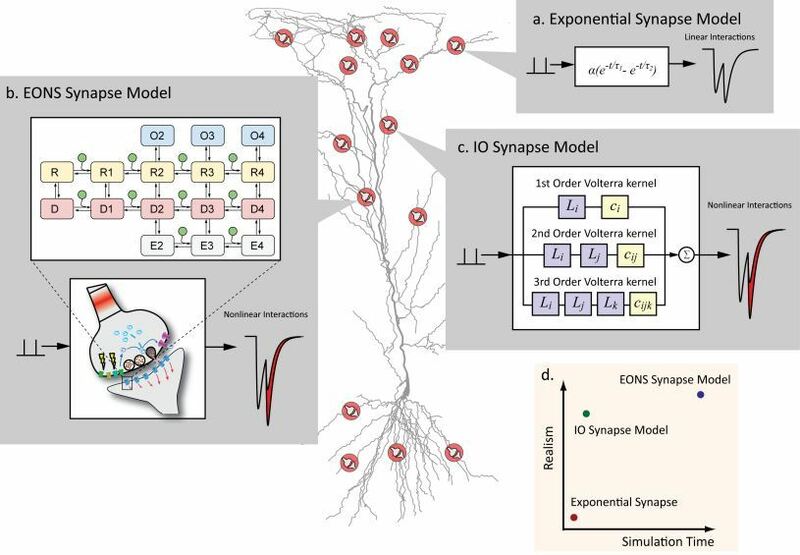 Eric Y. Hu, Jean-Marie C. Bouteiller, Dong Song, Michel Baudry, Theodore W. Berger, Volterra representation enables modeling of complex synaptic nonlinear dynamics in large-scale simulations. Front Comput Neurosci. 2015; 9: 112. DOI: 10.3389/fncom.2015.00112. Albash T., Bouteiller J.-M. C., Berger T.W., Baudry M., Haas S. (2013), Back Action on Neurotransmitters by Receptor Binding Reveals an Optimal Receptor Density Profile, J Comput Sci Syst Biol 6:327-336. DOI: 10.4172/0974-7230.1000129. 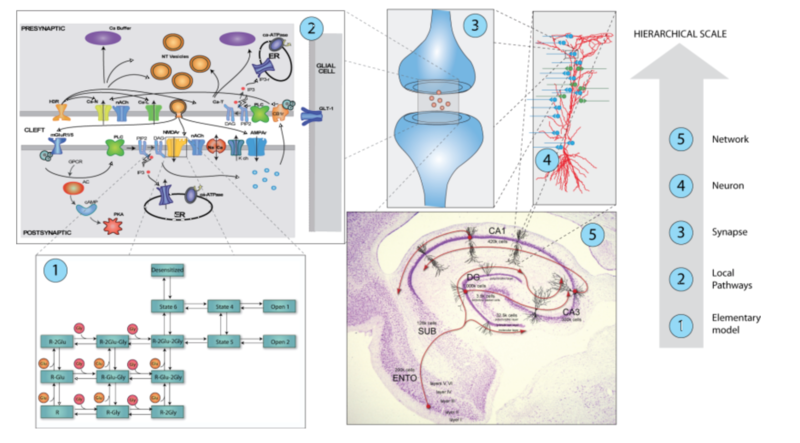 Baudry M., Greget R., Pernot F., Bouteiller J-M., Bi, X., mGluRI Roles under Physiological Conditions and in Neurodegeneration, Wiley Interdisciplinary Reviews: Systems Biology and Medecine, 2012. doi: 10.1002/wmts.51. Greget R., Pernot F., Bouteiller J-M. C., Ghaderi V., Allam S. L., Keller A. F., Ambert N., Sarmis M., Haeberle O., Faupel M., Bischoff S., Berger T. W., Baudry M. (2011), Simulation of Postsynaptic Glutamate Receptors Reveals Critical Features of Glutamatergic Transmission”, PLoS ONE 6(12): e28380. doi:10.1371/journal.pone.0028380.